Red Bull team principal Christian Horner is convinced that the necessary fuel for the mandatory one-litre sample was in Sebastian Vettel's car but that regulations preventing the removal of bodywork meant that it could not be extracted. The FIA stewards' decision stated that scrutineers found "an insufficient quantity of fuel for sampling purposes", which led to Vettel being excluded from qualifying. 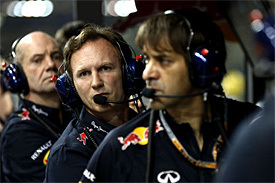 But Horner, who accepted that the penalty was fair, insists that the fuel was there, but that a full litre could not be extracted without removing bodywork, in contravention of Article 6.6.4 of the Formula 1 technical regulations. "The rules dictate that one litre has to be able to be provided without the removal of bodywork, without manipulating the car," said Horner. "We believe that the fuel is in the cell, according to what Renault have told us, but you cannot dismantle the cell to give the sample. "The car will be worked on tonight, so it is out of parc ferme, and we should have a better understanding and hopefully a cure for tomorrow." 6.6.1 Competitors must provide a means of removing all fuel from the car. 6.6.2 Competitors must ensure that a one litre sample of fuel may be taken from the car at any time during the Event. Except in cases of force majeure (accepted as such by the stewards of the meeting), if a sample of fuel is required after a practice session the car concerned must have first been driven back to the pits under its own power. 6.6.3 All cars must be fitted with a -2 'Symetrics' male fitting in order to facilitate fuel sampling. If an electric pump on board the car cannot be used to remove the fuel an externally connected one may be used provided it is evident that a representative fuel sample is being taken. If an external pump is used it must be possible to connect the FIA sampling hose to it and any hose between the car and pump must be -3 in diameter and not exceed 2m in length. Details of the fuel sampling hose may be found in the Appendix to these regulations. 6.6.4 The sampling procedure must not necessitate starting the engine or the removal of bodywork (other than the cover over any refuelling connector).